LED Controller 4 Key RF Remote 3 Channel RGB Aluminum Casing - VOLKA Lighting Pty Ltd.
8. 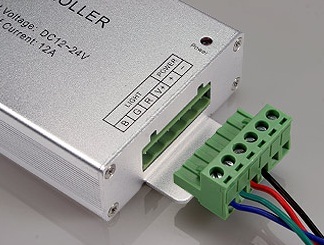 Rated load current: 4A per channel. 2. Wireless controller uses one 23A, 12V battery. 3. Connect according to the above drawing and note that the Green Connectors can be unplugged from the unit. 4. Red LED will come on when unit is receiving power, Green LED will flash when RF signal is received from handheld transmitter. 5. UP and DOWN buttons will only work when unit is in one of the four color-changing (dynamic) modes. 6. Controller can control a maximum of 30 meters of our Flexible RGB LED Strip. Over 30 meters, the Strips have to connect with an amplifier to reinforce the transmission of signal. 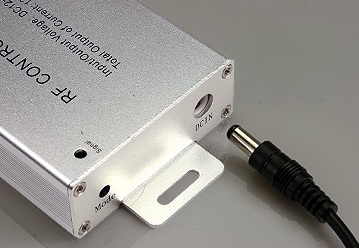 Use one RGB Amplifier for every 30 meters of additional LED Strips. 7. Do not exceed 80% of Power Supply capacity when calculating Power Supply size to use in your system. Click the button below to add the LED Controller 4 Key RF Remote 3 Channel RGB Aluminum Casing to your wish list.